This cemetery at Oughterard ranks high amongst my favourite sites visited recently. There is a very peaceful atmosphere here, with extensive views of the Kildare and Dublin countryside. A monastery is said to have been founded here in the 6th century by St Brigid, not the same Brigid who founded the monastery at Kildare. The Tower is not complete. It stands at about 9.5 metres in height and is possibly 14.5 metres in circumference at the base. The ground here undulates and is raised up around the tower and the church. 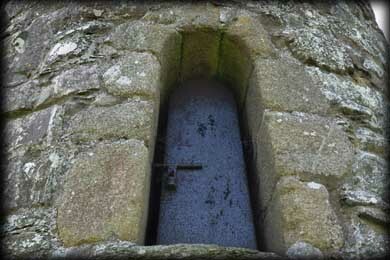 This may account for the doorway being only 2.6 metres above ground level. The east facing arched doorway shown above was constructed using large granite blocks, as was the remaining south facing window. 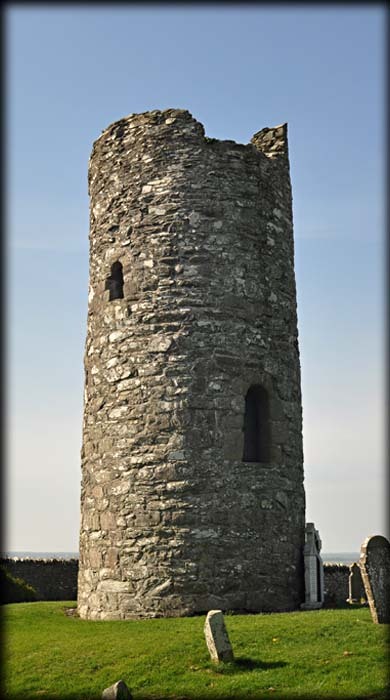 The rest of the tower was built with uncoarsed limestone. We arrived here about mid-day I would suggest that an early morning visit would be ideal to catch the sun on the doorway. 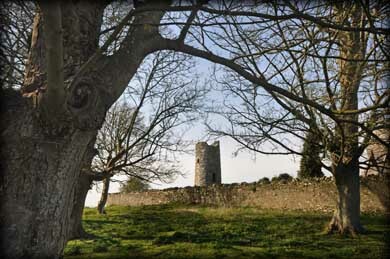 The walk up from the cemetery gate is very rewarding, with views of the tower through the trees. Situated: From Lucan Village head towards Newcastle. In the village take a right turn. Follow the road to the left. Take the second right. Then right at the crossroads. The cemetery gate is 2.5 kms down this road on your right. Discovery Map 50: N 9566 2624. Last Visit Mar 2012. Dimensions: Height 9.5 m. Diameter: 4.58 m.
Door: Above ground 2.65m. Type: Arched.